It’s always fun when a director can insert a famous actor into their movie for a quick cameo in a way that doesn’t detract from the film. That’s a fine line to walk, but when you get it right, you usually find out about it afterward and it just makes you like a movie you already enjoyed all the more. The most famous recent example was the discovery that Daniel Craig was slipped into Star Wars Episode VII as a stormtrooper. It’s something that you can definitely notice if you’re listening for his vote, but I had no clue that James Bond was wandering around Starkiller Base until I found out after the fact. Screen Rant has put together a great video going over 10 similar instances in film history where famous stars or directors made a quick appearance in famous movies. I’m not exactly sure what I had in mind when I walked into The World’s End, but I didn’t think that this was going to be the new leader for Best Picture…but it is. The World’s End is the most fun and the best movie I’ve seen this year to date. In many ways, this is the cap of a very strange trilogy of films starring Nick Frost and Simon Pegg; directed by Edgar Wright. Normal British town, seemingly normal side plots and then the complete and utter desolation wrought by zombies, cultists and-in this case-robot aliens. Hot Fuzz topped Shaun of the Dead and The World’s End is even better than Hot Fuzz. The plot centers around five friends in their forties, returning to their old hometown to try to re-enact the greatest night of their youth: the night they attempted to pub crawl all 12 of the town’s taverns; the legendary Golden Mile. If you’ve never been on a pub crawl or are unfamiliar with the concept, it’s still entirely possibly you’ve been on one and were too drunk by the end of it to recall what you started out doing. A pub crawl is like a marathon (only if you’re running it’s likely from the police and instead of hydrating yourself, you’re inhaling liquid wheat). You visit legendary bar after bar, consuming at least one drink at each. These five friends fell short in their youth, but are back to try it once more. The reason they’re back. The ONLY reason they’re back is Gary King (Simon Pegg who-no kidding-needs an Oscar nom for this). Gary is the guy we all know. The guy for whom high school never really ended because it was the peak of his existence. The other four friends in his group have all moved on to jobs and families and Gary still plays mix tapes he made in high school in the car stereo of the car he drove in high school (THE BEAST). He begs, borrows, wheedles and coerces the rest of the group into joining him and they set off on The Golden Mile. This odd trilogy has always managed to weave very serious and heavy themes in-between bouts of zombie slaying or cultist fighting. It’s one of the things that make the films so unique and so enjoyable. This was a great movie before things went sideways. It deals with growing up, moving on, going home to wonder if you’ve changed or the place has, friendship and unfulfilled life expectations. Then around pub three, Gary gets attacked in the bathroom and ends up pulling the head off of a robot alien filled with blue ink and we are off to the races. The quintet had been noting ever since they arrived back home that people seemed a bit off; everything a little too perfect. The answer is simple: aliens have taken over the town and replaced its residents with replicant copies that are put together a bit like action figures filled with blue goo. While the rest of the group would very much like to get out of the alien goo town, Gary is obsessed with finishing The Golden Mile. That night was the best night of his youth and he’s fixated on recreating it (even if malevolent robots trying to steal his soul become part of the equation). 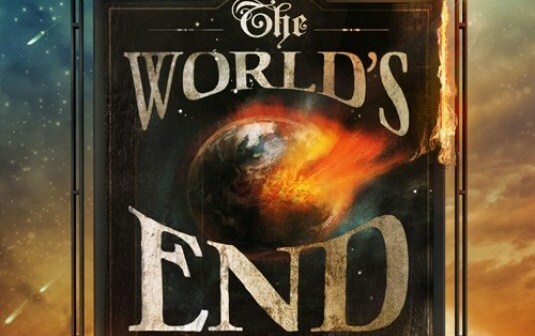 From pub #3 until it’s surprising conclusion, The World’s End is a fireball of hilarity, incredibly violent blu-ish battles and a mad dash toward the final pub in the Golden Mile: The World’s End. Simon Pegg is an absolute force of nature in this movie. He’s a hurricane-force personality wrapped in a trench coat. Not only does he have the best and funniest character (we all know Pegg is funny), he has the most poignant dramatic moments and there’s one at the end that tears your heart out. Though there’s a better chance of me being nominated for an Oscar, this is the kind of performance that deserves recognition. The World’s End is nearly indescribable. I’m amazed I could find this many words to try to sum it up. It’s a must-see in a year of disappointments.